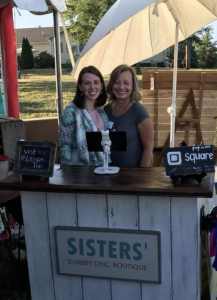 Based in Southern Indiana, our small business started out as two sister-in-laws with a desire to make art. As time has progressed, our business and design has transformed into rustic, shabby chic and vintage. We are constantly attempting to create new products and designs for our customers to love. Of course, a lot of our designs are custom and inspired by customers like you. We sell most of our products at weekend markets, but do have a small amount of items in a couple of brick and mortar stores. We also sell our jewelry wholesale to a couple of boutiques! Mary is the head of the operation, one of the co-founders of Sisters’. She is the lady behind our rustic wood signs, some jewelry, and most of our refinished furniture. She loves Jesus, her family, travel, and art. Hannah, Mary’s daughter, is a middle school English/History teacher (Bless her heart.). She loves books, globes of any type, and dogs. Specifically her boxer mix, Luna. Hannah is known around here for necklaces, keychains, and her arm-knit scarves. She is a large part of our marketing and communications. Rachael, Mary’s daugher-in law, married the handy son, Zach. She is responsible for our sewn crafts/shirts, wood door hangers, and some jewelry. In addition, she does her best to talk Zach into coming up with creative wood pieces/designs. Rachael is passionate about women’s health, as she works as a Nurse Practitioner. She’s a boymom through and through, loves Jesus, and soaks up any time with friends and family that she can. That sums up most of our group and how Sisters’ came about, an outlet for our creative passions. We thoroughly enjoy getting to meet new customers and visit new markets. Please feel free to reach out on the Contact Us page and let us know how we can serve you.